Often with the Tarot, and specifically with the Major Arcana, it is useful to do a meditation based around a particular card. This is a method of becoming more in tune with a particular aspect of the Tarot. Or you can also examine a particularly difficult life issue that is coming up. Overall, Tarot meditations are a wonderful way of connecting with your personal deck, and helping you understand certain paths in your life. There are a number of ways to select a tarot card, depending on your intention. For the purposes of bonding with your deck and general meditation on the Tarot, I suggest starting with the Fool, and moving forward from there. If you are struggling with an aspect of your life then you can seek this meditation as a guidance. You can either select the tarot card that feels most appropriate, or one that seems to be a recurring theme throughout your recent tarot readings. The base method of Tarot meditation is quite simple. You seclude yourself into a quiet space with your Tarot deck. Optional accoutrements are a piece of cloth for reading on, whose color can vary based on the aspect of the Tarot you’re meditating on, and a candle of matching color. In either space a white or black cloth will stand in for a specific chosen color. It is generally suggested that for most upright cards, if you have not selected a specific color, you use white candles and a white cloth. For inverted cards, a black cloth and candle is best. This is just to ensure a measure of protection against the often negative energies of the card. Incense can be selected for it’s various properties as well, to enhance your meditation, and music in keeping with the theme of the card. 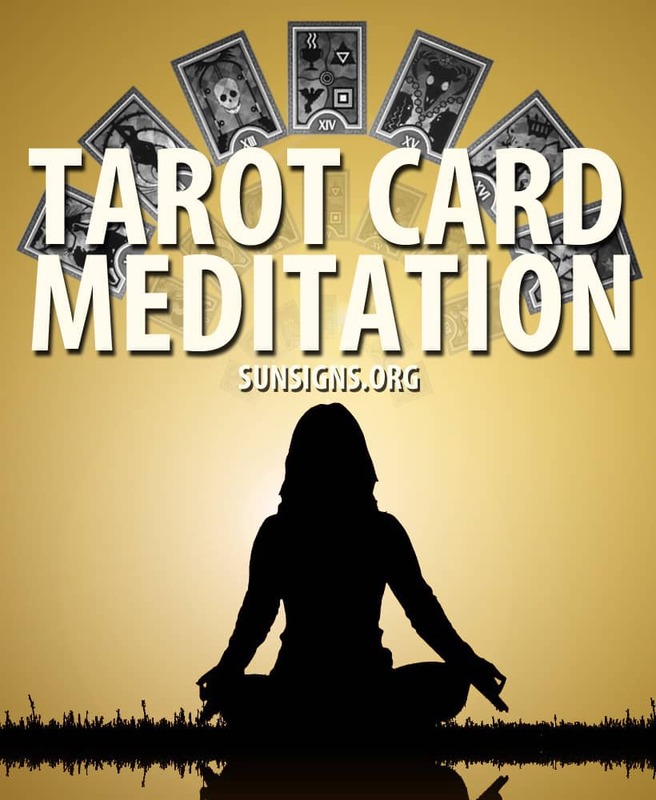 Once you have the environment conducive to an uninterrupted meditation, place the tarot card in front of you in the preferred orientation, light the incense and candle, and take a few breaths to center. Rest your eyes upon the card, taking in it’s imagery without truly attempting to ‘see’ it. There will come a point where you will find yourself within the scene on the card. From that point, let your meditation guide you, or use one of the guided meditations elsewhere on this site. When you complete your meditation, it is advisable to keep a record of the contents of said meditation. Taking careful note of the atmosphere, anything people said, bits of the meditation of the Major Arcana that seemed to jump out at you. It can also be relevant to mark the time and day of the week, as well as the numerical day and the month. Check the moon phase and what house the sun is in. All of these things can potentially influence a meditation on a particular subject.